Using a combination of antistatic NOMEX® HOCOTEX and Eagle fabric, the Sparco Eagle RS-8.1 single layer race suit is lightweight yet strong. The Hocotex honeycomb structure is ultra-thin (0.6 mm), extremely breathable and lightweight (average weight of only 300/330 gr/m²). A stretch panel in Eagle fabric is positioned on the underarm, sides and back for maximum driver fit and comfort. The classic-style quilting of the Eagle RS-8.1 racing suit is made using a very thin yarn, reinforced with abrasion-resistant material on the legs and arms ensuring the suit should stay good looking for longer.. The racing suit features shoulder epaulettes with integrated extraction handles which are FHR device friendly and have been designed to reduce pressure during racing. Picture For Illustration Purposes Only. Our clearance stock is populated via an automated system so stock takes 24 hours to update. 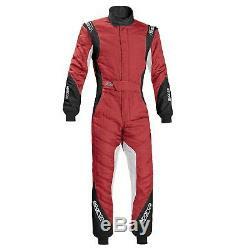 The item "Sparco Eagle RS-8.1 FIA Approved Race / Rally Suit Red / Black Size 48" is in sale since Wednesday, June 20, 2018. This item is in the category "Vehicle Parts & Accessories\Clothing, Helmets & Protection\Car & Kart Racewear\Race Suits". The seller is "demontweeksoutlet" and is located in Wrexham. This item can be shipped worldwide.